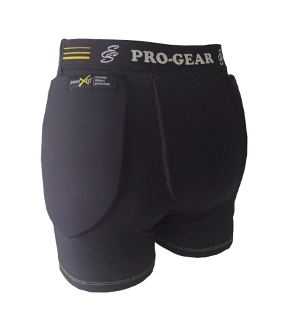 ES Performance Pro Gear Protective Skating Shorts are the most advanced skating protective shorts on the market. They combine very high quality fabrics with state of the art protective material made by Poron. The function of the XRD foam is to "freeze" upon impact, then become soft and flexible right after. The 6mm (1/4") pads can be removed with easy when you don't need them. This product was developed in cooperation with Poron and tested it in many conditions with low and high level competitive skaters. Available in Child M - Adult L.
Padding at hips and tailbone. High stretch fabric with Moisture management function. Ultra-low profile for improved comfort and style. Sticky silicone lines at the bottom of the leg for secure attachment.